In 1958, fifty-seven jazz musicians gathered on a street in Harlem to pose for a photo for Esquire. The photo entitled "A Great Day in Harlem" became an iconic image from the 20th century, and the story behind the photograph is amazing. 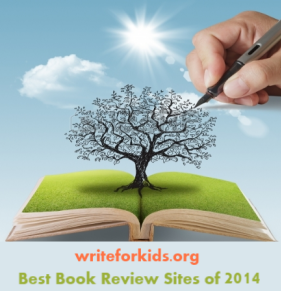 In this extended picture book, Roxanne Orgill uses free verse poetry to describe how the photograph came to be. It was conceived by Art Kane, an art designer and fan of jazz music. Kane was not a photographer; he didn't even own a camera. Kane pitched his idea to Esquire, made an open invitation to musicians in New York, and borrowed a camera. The rest is history. 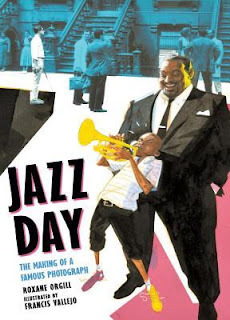 As readers turn the pages of Jazz Day, they are introduced to jazz musicians including Thelonius Monk, Mary Lou Williams, Count Basie, and Duke Ellington. The poems eloquently convey the mood of the day while also describing the interaction of the musicians, their attire and how children in the neighborhood lined the curb to watch the event. Vallejo's realistic, acrylic and pastel illustrations capture the festive atmosphere and emotions of the musicians as they gather on the street. Near the end of the story a page folds open to reveal the impressive black and white photograph. Be sure to read the back matter which includes short bios of several musicians, an author's note, an extensive bibliography and a diagram that labels each person in the photograph. There is so much goodness packed into just sixty-six pages of Jazz Day. It is a recommended purchase for school and public libraries. Pair Jazz Day with Duke Ellington by Andrea Davis Pinkney, Harlem by Walter Dean Myers, and Jazz on a Saturday Night by Leo Dillon. I predict that we will hear more about Jazz Day when the ALA Youth Media Awards are announced in January. Click here to view the photo "A Great Day in Harlem."